Jawahar Navodaya Vidyalayas face serious challenge: 11 students kill themselves in Class 11, 15 in Class 12. Jawahar Navodaya Vidyalayas (JNVs), the central government’s pace-setting residential schools for talented rural children, have had close to 50 suicides on campus in just five years, an investigation by The Indian Express has revealed. 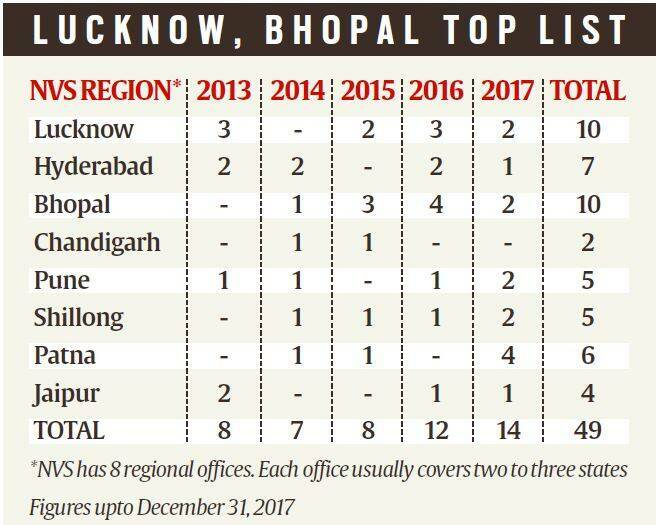 Of the 49 suicides witnessed from 2013 to 2017, half were by Dalit and tribal students, and a majority of them were boys, records obtained by The Indian Express under the Right To Information (RTI) Act show. And all, except seven, were suicides by hanging, and the bodies were discovered either by classmates or members of the school staff. Known for producing the best results in board examinations, the JNVs, which were started in 1985-86, have become a passport out of poverty for thousands of underprivileged children. Since 2012, these schools have consistently recorded a pass percentage of over 99 per cent in Class 10 and over 95 per cent in Class 12, which is far better than private schools and CBSE’s national average. “The Navodaya Vidyalaya system, which began as a unique experiment, is today unparalleled in the annals of school education in India and elsewhere,” states the official website of the Navodaya Vidyalaya Samiti (NVS), an autonomous organisation under the HRD Ministry tasked with managing all 635 JNVs. From the official website of Navodaya Vidyalaya Samiti. According to norms, at least 75 per cent of the seats in these schools are set aside for rural children. Hence, a JNV is never sanctioned for a district with 100 per cent urban population. A Navodaya Vidyalaya starts from Class 6 and goes up to Class 12. All admissions in Class 6 are done through a merit test. In fact, the popularity of JNVs is evident from the fact that less than 3 per cent of the candidates appearing for the entrance test every year makes the cut. However, data obtained by The Indian Express and verified individually with 41 out of 46 vidyalayas, shows that JNVs are facing a serious challenge. The Indian Express has not revealed the identities of teachers and school authorities it spoke to. Currently, there are 635 JNVs with 2.8 lakh students. As on March 31, 2017, a total of 2.53 lakh students in the age group of nine to 19 were enrolled across roughly 600 JNVs. That same year, the number of suicides touched 14. Hence, the suicide rate — suicides per population of 1,00,000 — at JNVs for 2017 works out to 5.5. In other words, for every one lakh students studying in these schools, almost six students committed suicide in 2017. This is slightly higher than the national suicide rate for a similar age group in 2015 — roughly 3 suicides per lakh population aged 6 to 17 years. Given the population in JNVs, the number in absolute terms is not very different from the suicide rate in the general population of that age, but what is significant is the profile of victims — more than half are Dalits and STs. *Student suicides in JNVs first hit double digits (12) in 2016 and peaked last year with 14 suicides. In all, there have been 49 suicides in 46 schools across 20 states in five years, from 2013 to 2017. The states of Madhya Pradesh, Uttar Pradesh, Andhra Pradesh, Odisha, West Bengal and Uttarakhand alone account for more than half of the total suicides. *The largest number of student suicides (16) in JNVs was by students belonging to the SC category. SC and ST students together account for over half or 25 suicide deaths in Navodaya Vidyalayas. The general and OBC category students account for 12 suicides each. In JNVs, seats are reserved for children from SC and ST communities in proportion to their population in the district where the school is located, but not less than the national average, which is 15 per cent for SCs and 7.5 per cent for STs. According to enrolment data as on March 31, 2017, 55 per cent (or 1,41,022) of the total intake were students from the general category (including OBCs) and the remaining — 25 per cent SC and 20 per cent ST — from the reserved categories. *Thirty five, or roughly 71 per cent, of the 49 suicides were by boys. The ratio of boys to girls in JNVs is 60:40. *All suicides, except six, are by students in Classes 9, 10, 11 and 12. 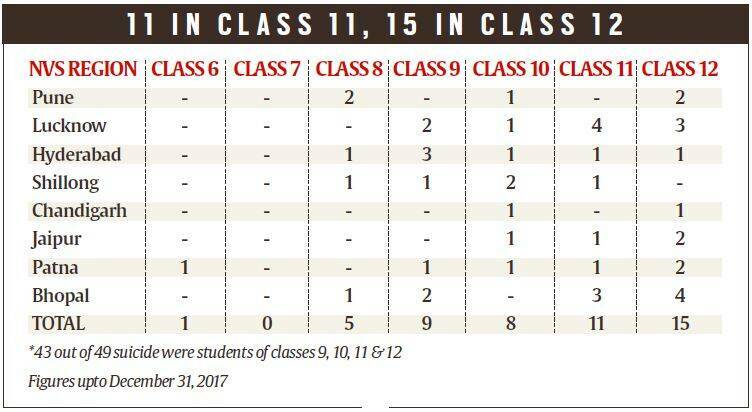 The highest number (15) is of Class 12 students, followed by Class 11 (11 suicides), Class 9 (9) and Class 10 (8). *In 42 of 49 cases, students died by hanging. That apart, there were two deaths by drowning, two by jumping from a height and three by jumping in front of a train. Currently, there is no system in place for professional counselling of students traumatised after discovering or seeing their schoolmate’s dead body on campus. *The causes of suicides in JNVs are disparate and range from unrequited love, family problems, corporal punishment or humiliation by teachers, academic pressure, depression, and fight between friends. Of these, the first three are cited most often as reasons behind suicides. Interestingly, suicides peak in the three months following the two-month-long summer break that ends in July and during the examination season, that is, January, February and March. According to NVS commissioner Bishwajit Kumar Singh, the timing of suicides reflects that students, after spending considerable time at home during summer vacation, have a tough time adjusting to school life or that they are stressed over strained domestic relations. Alarms bells went off in the Navodaya ecosystem in 2016, when suicide figures hit double digits for the first time. The NVS shot off an 11-page circular in November, 2016, listing out ways to spot suicidal tendencies and prevent suicides on campus. The circular states that when a suicide takes place within the school premises, a JNV cannot escape responsibility. “A child cannot take all of a sudden such an extreme step without showing some visible symptoms in advance. Vidyalaya administration failed to detect such symptoms though these symptoms were heard or seen by the students they were taken lightly,” it said. However, three years after the above circular was released, much of government’s plans for stemming the growing trend of suicides in JNVs remain on paper.